The ad also accuses Campa-Najjar of changing his name to “hide” his family's connection to terrorism in reference to his grandfather's involvement in the 1972 Munich Olympics terror plot. The narrator says Campa-Najjar’s grandfather was the mastermind behind the attack, although a different member of the terror group that carried out the attack took responsibility in 1999. The Washington Post fact checked Hunter’s ad and gave it “Four Pinocchios," its worst rating, for failing to mention that Campa-Najjar’s grandfather was killed by 16 years before he was born. 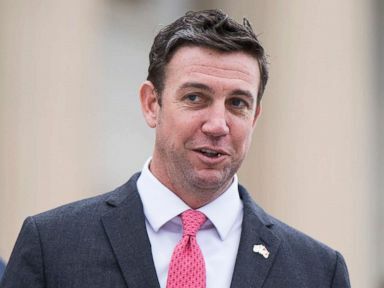 Rep. Duncan Hunter walks down the House steps after final votes of the week in the Capitol Feb. 15, 2018. The ad also failed to mention that, Campa-Najjar, a Democrat and former Obama staffer changed his name to honor his mother's Mexican family, the Campas. He changed his name years prior to this race, according to the Washington Post. Campa-Najjar, a Palestinian Mexican American, grew up in a Christian household in San Diego. He worked at the White House under President Barack Obama beginning in 2013 and at the Labor Department until 2017. 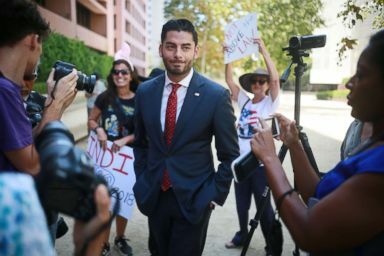 Ammar Campa-Najjar, who is running against Congressman Duncan Hunter, speaks to reporters outside the San Diego Federal Courthouse during Congressman Hunter's arraignment hearing, Aug. 23, 2018, in San Diego, CA. According to the Washington Post, he had security clearance for both of those jobs, which required him to pass an FBI background check. Campa-Najjar has taken to Twitter to defend himself. Hunter’s ongoing attacks on me, his wife, & the DOJ aren’t just political; they’re pathological. While Hunter lacks personal accountability, voters know his family isn’t responsible for his actions & I’m not responsible for my family’s actions. ABC News partner FiveThirtyEight gives Hunter a six in seven chance of winning the race.